The Gran Hotel, 3 blocks from Parque Calderón, the center of the Historic District, has a delightful interior courtyard. Like the majority of buildings in this old section of town, the courtyard here is hidden from street view, but once inside, we are treated to a jungle of plants, some as high as the 2-storey enclosure itself. Both breakfast (included with the room-rate of $35/night) and the 4-course lunch ($3.50, no tipping allowed) are served here from 7AM until after 2PM. I’m here in-between the 2 meals, wondering how they will remove the body from the 2nd-floor room before lunch. Since all the rooms front the courtyard, the platoon of EMT’s, local and state police, and the criminalistics team, along with the hotel staff are working out the logistics. I’m sitting off to the side at a small table watching the staff move the dining tables for what appears to be an over-the-rail descent. Really, it’s a front-row seat and unless they tell me to move, I’m here for the duration. Two hours ago, while finishing up a late breakfast, I heard running feet from the floor above and looked up to see the First Responders entering the room. Shortly after, the initial cadre of police arrived, and then later the CSI group. I knew from the lack of urgency that whomever was checked into the room had left for good and now it was time for all the paperwork. I can’t help but think of Sir Terry Pratchett, who just died a few days ago. It’s been 15 years since I was introduced to his “Discworld” satires, and if I haven’t read all of his several dozen books in the series, plus other similar works, it’s not from lack of trying. But Cuenca is far more than dead bodies. It’s now Friday and Frank and I arrived here in Cuenca on Monday. 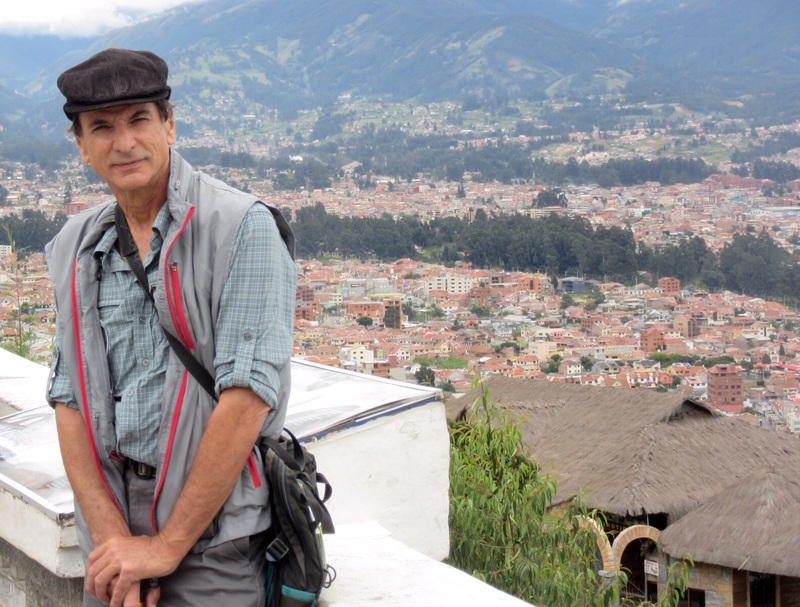 We’re flying back to Quito Sunday morning with Frank returning to the US early Monday morning. So we still have some fascinating sights to take in. This is a very interesting city and like Quito, selected as a World Heritage Site. Cuenca is Ecuador’s 3rd largest population center, at about 1/2 million people in the city proper, with an extensive suburban development. This beautiful city, with 4 rivers running through it and defining it’s internal boundaries, is regarded as the cultural heart of Ecuador. It’s easy to see why, with 3 major universities, both an old (16th century) and a new (19th century) cathedral, plus a dozen or more beautifully preserved churches, period buildings with balconies like those in New Orleans (or France, for that matter), museums, Inca ruins, and more. Cuenca is a delight to the eye. In fact Cuenca is such a delight that I’ve concluded that I cannot live here. Since we got here Frank has developed a passionate love-affair with the city and he plans to return with his wife for a visit very soon. 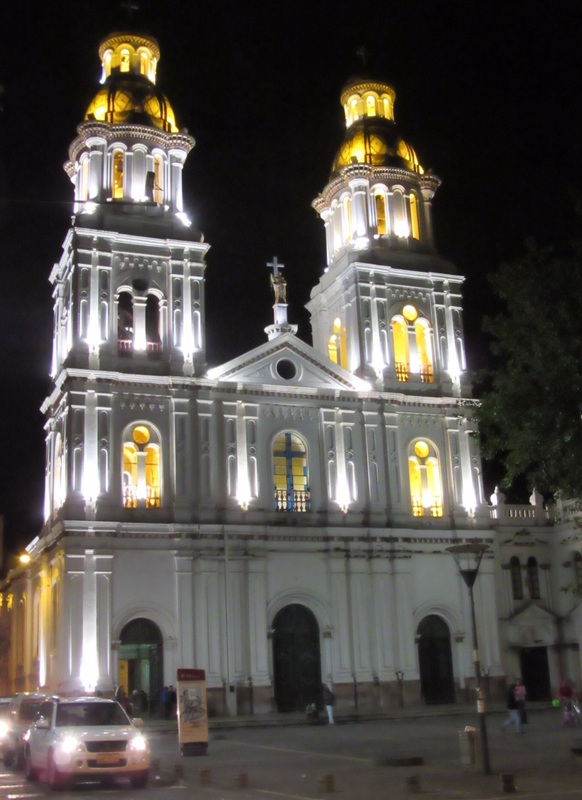 With it’s bite-sized colonial district that can be walked end-to-end, both north-south and east-west in less than a day, and with a climate far friendlier than Quito’s, Cuenca seduces very easily. And that is my problem. 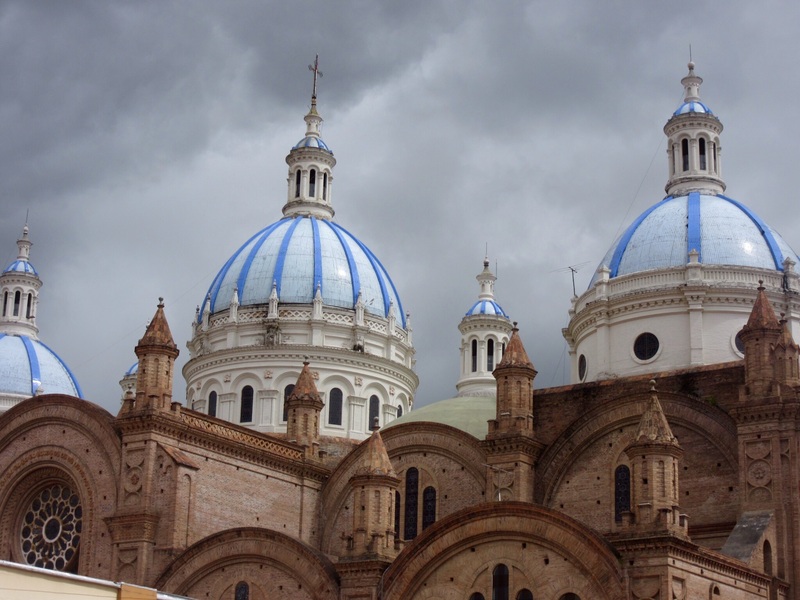 Sometime in 2009 Cuenca was selected as the most desirable retirement destination in the world. This singular prize, decided by any number of international living periodicals, and seconded many times since by other publications has not gone unnoticed by an ever-growing number of expats. Earlier this month the federal government released its figures of approximately 12,000 expats living in Cuenca, with about 8,000 of them from North America. Yet walking the Historic District, or limping along with a cast in my case, some things catch my eye. Perhaps the decades I’ve spent in Honolulu and Santa Fe have soured my soul towards hot tourist destinations, I don’t know. But here in Cuenca I feel a distinct division between the expats and the local population. There is a palpable disconnect between the 2 communities even though they trod the same paths. It’s as if a colony of ants and a colony of elephants occupied the same land, with both populations busily going about their business and not a clue that the other colony exists. I realize that this is a gross over-simplification, but it feels real to me and I don’t want any part of moving here. Though the 2 of us dropped in on 3 very competent Spanish language schools to see about enrolling in their immersion programs, I just can’t do it. All 3 are within 4 blocks of each other, a few blocks from the hotel and the central plaza as well. It feels as if I would suffocate from the claustrophobic closeness of everything. And living with ants and elephants is not something I would willingly do. Would I come back to Cuenca for a visit? In a minute! The place is gorgeous and known for some of the best food in the country. Its venues host world class symphonies, dancers, writers, painters, sculptors and much more. But I prefer losing myself among the millions in cold and rainy and chaotic Quito. 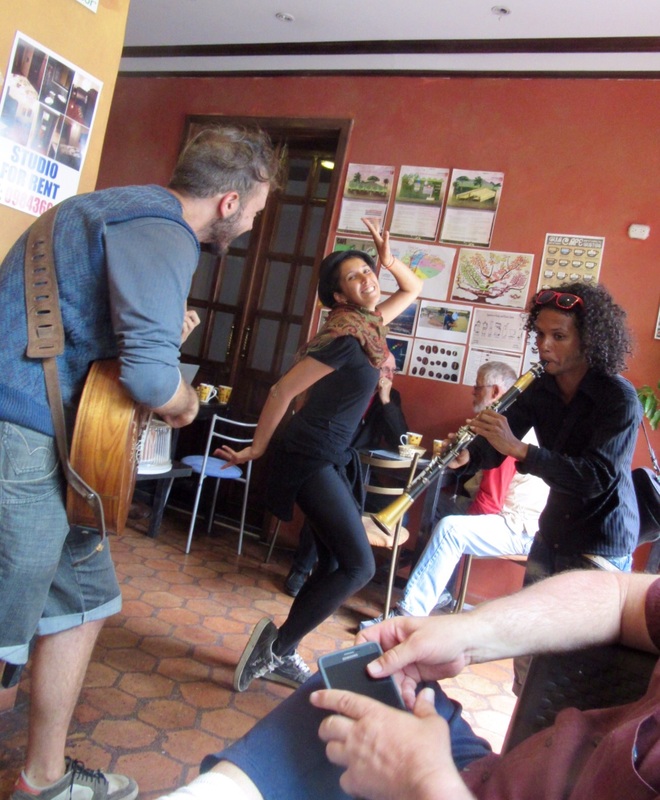 This entry was posted in Uncategorized and tagged Cuenca, expats on 2015-03-19 by kmalivuk. Thanks for the thoughts. I never can tell how a post will be received. And the comments, or lack of same, keep me guessing. Rest assured us nalo folks welcome each new post. Sometimes unable to craft a comment worthy of the essay. I feel a mystery novel evolving from your travels. Shanon, it’s not like I’m making this stuff up, but I just sit there and the world rolls by 😉 When I started writing this last post Frank had gone off to visit Cajas Nat’l Park (and got chased by a guanaco! ), while I planned for a quiet morning to catch up on my correspondence. Truth really is stranger than fiction. Who Knew??!! Homicide? Suicide? Natural causes? What happened next ? Though I will say that after the cleaning crew finished and the smell of Lysol drifted down to the dining area, the room was ready (and filled) before Frank and I left on Sunday.